Maria Fareri Children’s Hospital, a member of the Westchester Medical Center Health Network (WMCHealth) and the children’s hospital for the Hudson Valley and Fairfield County, recently named three inspiring former patients – Kaylee Fried, 7, Zechia Mickler, 6, and Tyrus Castrovinci, 6 – as ambassadors for the 13th annual Go the Distance Walk and Family Fun Day, representing the pediatric patients cared for at Maria Fareri Children’s Hospital. The annual event benefits Maria Fareri Children’s Hospital and celebrates the health and fortitude of its remarkable patients. Held this year on May 7, the event is Maria Fareri Children’s Hospital’s largest annual fundraiser and draws thousands of former patients, families, staff, and supportive community members from around the region. Following a casual one-mile walk around the hospital’s campus – the event’s signature processional led by the ambassadors – participants will enjoy a morning filled with fun activities for the whole family. In past years, the Go the Distance Walk and Family Fun Day has featured a single Grand Marshal; this year, three very special patients will lead the crowd as ambassadors. 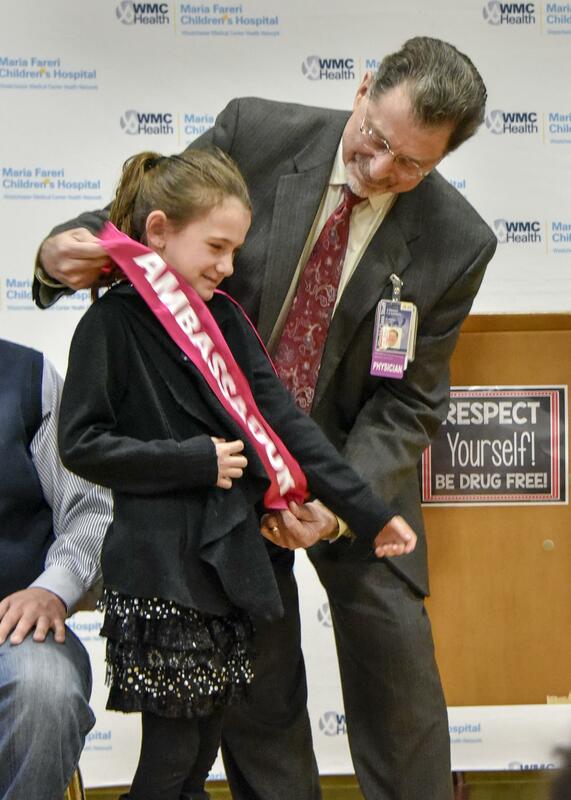 Kaylee Fried, 7, of Harriman, was born at Good Samaritan Hospital, a member of the WMCHealth, seemingly healthy at only 36 weeks. After a few short hours of observation, she was diagnosed with a rare birth defect in which her stomach and esophagus were not connected. She was transferred to Maria Fareri Children’s Hospital, where surgery was performed to repair the defect. 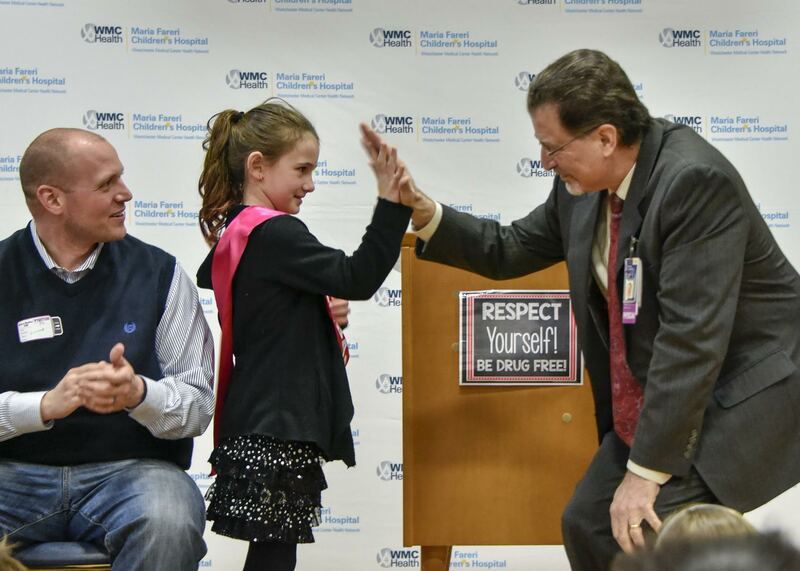 After less than one month of recovery and a small amount of follow-up care over the first few years, Kaylee is doing great, and is now a healthy 7-year-old second grader at Pine Tree Elementary School in Monroe. Kaylee’s fundraising team, HarperSmiles, will participate in this year’s event in memory of her little sister, Harper, and in honor of the more than 20,000 children cared for each year by the pediatric services offered at Maria Fareri Children’s Hospital. Zechia Mickler, 5, of Beacon, was diagnosed with a life-threatening diaphragmatic hernia at age 1, when she was rushed to Maria Fareri Children’s Hospital in respiratory distress. Because of the hernia, her lower abdominal organs moved into her chest and doctors at the Children’s Hospital used minimally invasive techniques to correct the organs’ location. Zechia recovered quickly and thanks to the advanced care she received, is now a healthy 6-year-old in the first grade at J.V. Forrestal Elementary School in Beacon. Zechia loves to dance and is a fixture at Children’s Hospital events. Her team is Zechia’s Breath-Takerz. Tyrus Castrovinci, 6, of the Bronx, was diagnosed with a multitude of heart problems – including a hole between his right and left ventricle and a narrowing of a pulmonary valve – before he was even born. Following an angiogram at just three months old and a full-blown open-heart surgery at six months, Tyrus has never looked back. Now a 6-year-old kindergartener at P.S. 71 in the Bronx, Tyrus loves baseball, karate and soccer, and he even started his own YouTube channel recently. Ty’s Heartbeats are his team.